"Vestrucci, is not just another Florentine tailor! 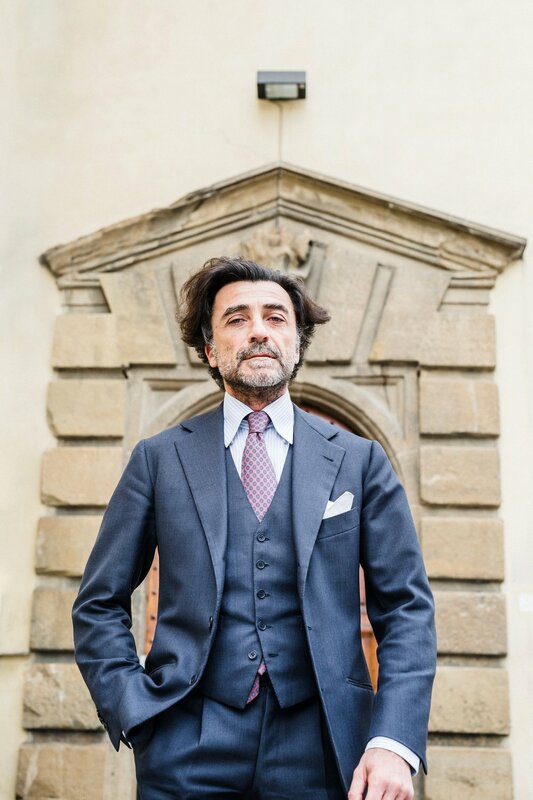 When younger generation mention Florentine tailors, they mostly refer to overly mythical commercial tailor, or some growing apprentice tailor from Japan. Gradually, people take a few generalization to describe "the Florentine look". Yet, what sets bespoke garments apart should not be some summarization, it's in the subtle difference. Hence each tailor's work is a true celebration of individualism. The city of Florence was never short of tailor legends in history: Maltagliati, Rossella, Giuntini, Franchi, Cappelli, Di Preta, Speciale e Mealli. Most of these stars have sadly faded away. Nevertheless, we are extremely blessed to still be able to see one of them shining, Loris Vestrucci. Like most of the tailors within Tuscan region, Vestrucci's take on aestheticity combines Italian flavor with British decency. It's just like the city of Florence. There are many features can reveal that Vestrucci runs deep in Florence blood. First, his jackets are always cut without the front darts. Loris is not impressed by the extended front darts of the Neapolitan tailors. To him, it's to take a shortcut in cutting the pattern. The dart-less front look is originated from Dutch tailor Frederick Scholte, who trained the founders at Anderson & Sheppard and invented the famous "Drape Cut". One of his philosophy was to minimize the seams on the jacket, hence removing the front cuts. This becomes a profound influence on Vestrucci as well. But instead of sacrificing the fit of the garment, Loris Vestrucci takes one step forward and builds lots of shape to the curves through cutting and ironing. Hence the wearer can appreciate the benefits of uninterrupted front pattern, but also can enjoy the comfort and visual pleasure of the curves. It's a perfect example of British formality and Italian passion. Second, it's all about the shoulder. A first glance of Vestrucci's shoulder can easily ensure it's an Italian shoulder. It's extended, round, whispering through that nice rope. Although being full and majestic, It won't create the bump at the connection area between shoulder end and sleeve head, like most English makers. 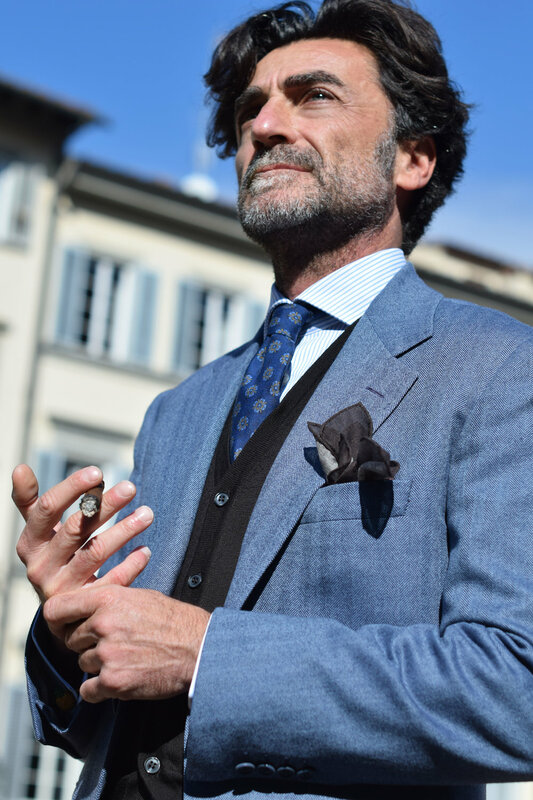 On the other hand, it's not as exaggerated as the "spalla camicia" shoulders by southern Neapolitan tailors, nor square and stiff as the padded shoulders by Northern Milanese tailors. Just like the city of Florence sitting in the center of Italy, Vestrucci shoulder has that perfect balance. Last but not least, the generous lapels and straight chest welt pocket give wearer the muscular charm. The angel of the notch is slightly on the lower side, which just covers a tad of the chest pocket. This proportion, together with the unpadded and concaved shoulder line, perfectly frames the face of the wearer, creating a relaxed and nonchalant vibe. You could imagine a real connoisseur dressed in Vestrucci, slowly enjoying his Tuscany coffee and cigar for the entire afternoon, like the time in the world has nothing to do with him. All the above characteristics define the roots of Vestrucci , and many other great Florentine tailors. There are a few more values that make Vestrucci's jackets distinctive. First is the opening quarter. Some tailors like to make the opening very wide, with the illusion of longer legs. It's contemporary and may flatter certain body shapes. However, Vestrucci strictly stick to the essence of British tailoring on this specific matter. To him, a gentleman should not reveal too much of his "private area". So he still use the same exact tools that his maestro passed along to him, to cut the conservative, more closed front quarter. It's not only just about style, but also a matter of functionality. When the wearer is in motion, the quarter will inevitably open up more, a more closed front quarter can accommodate just the right amount accordingly. "I don't make jackets for those standing still magazine shoots, my jackets are for real gentlemen in real life." says Loris with a witty smile on his face. Second, they say lapels to a jacket are just like eyes giving the life to a face. Vestrucci likes to give his lapels a little bit more belly, but just to the extend that it's almost invisible. Some tailors like to cut the lapels more bending inwards. Vestrucci believes that will make the whole look almost too aggressive. He conveys his attitude through his scissor and cutting board. "A elegant man is who looks modest to both his friends and enemies. He should keep his friends close, his enemies closer." A bellied lapel is elegant, relaxed, and more importantly, tolerating. The fact that the belly is almost unnoticeable should be credited to Loris' 69 years of cutting expertise. "It's great to be tolerating, but gentlemen know when to stop, nothing more, nothing less!" Just like how the lapels bend. Third, quality is all in the make! Loris intentionally hide dozens of his magical tricks inside his jacket. It's like Da Vinci codes. "I'd like to think it's the secret between my dear client and myself. He trusts me when we shake our hands." For example, the besom pockets have the inner flaps and stitching, which are entirely unseen from outside. The high armhole construction have all over hand stitching, giving the wearer the perfect amount of flexibility. Trouser pleats are all basted for permanent shape, after hours of ironing. All these painstaking handwork are not presented to most untrained eyes. But they have been exactly the details and making process that differentiate maestros and normal tailors.